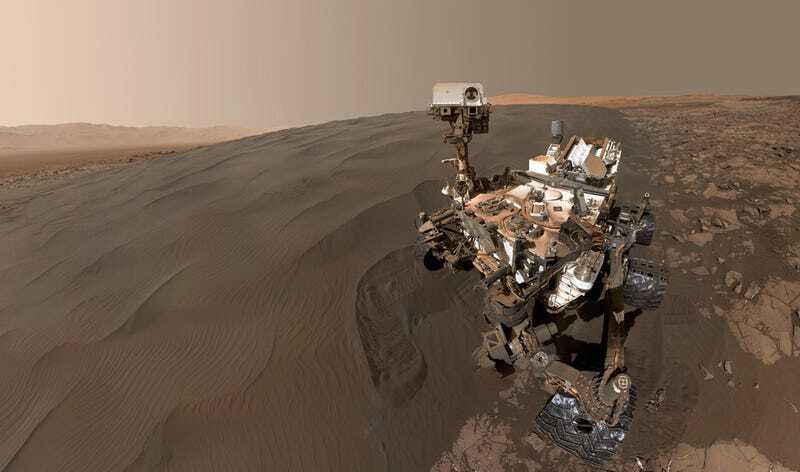 The Curiosity rover was sent up to Mars with the important job of hunting for microbes on the red planet’s surface. Now, that job is done, and Curiosity is getting a new mission—and that mission is all about the past, and future, of life on Mars. A new team of scientists was just selected to take over science operations for the rover, but since Curiosity already completed its primary mission, what will they be working on? JPL provided us with the full list of every scientific project the rover will undertake in its first extended mission, which you can see in its entirety below. It’s clear from this list that the big link between the studies is an effort to get a clear picture of just what happened to take out life on Mars. Look, for instance, at “Understanding Iron Oxide Formation in Mt. Sharp & Implications for Past Habitable Environments” or “Using composition to constrain paleoenvironments and sites of organic preservation in Gale Crater”. But the more you look at the studies, another point emerges. There are studies on the current radiation levels on the surface of Mars, and studies comparing what sites would have been the most habitable sites. In other words, the question isn’t simply what happened to life on Mars in the past, it’s also about what might happen to life on Mars someday in the future. When we talk about life on Mars, we’re no longer just talking about what life may have arisen there in the past—we’re also talking about our own future and what it might mean for us to survive on Mars. As we start to dig deeper into that question, studies like those Curiosity is undertaking in its extended mission are going to be important first steps to figuring out how to get there.